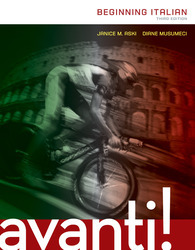 As the fastest growing introductory Italian title, Avanti! Beginning Italian continues to evolve to meet the changing needs of instructors and students. Professors are offering more hybrid and online courses, technology is providing functionality we could not envision just a few years ago, and the types of students we teach are ever-changing. Thus, in planning the third-edition revision, it was critical to retain the best parts of our program while responding to the changes around us. The title Avanti! conveys the forward-thinking approach of this program, which is designed to guide experienced and inexperienced instructors in creating a truly communicative, interactive environment for their students. In preparation for this edition, we employed a wide array of market research tools to identify a number of areas for digital innovation. As a direct result of our research, this new edition offers McGraw-Hill's Connect™ and LearnSmart™ with their game-changing, adaptive, and digital learning resources. These powerful, digital tools, now an integral part of the third edition, complement and support the goals of the Avanti! program and address the needs of the evolving Introductory Italian course. How does Avanti! with Connect and LearnSmart support the needs of Italian instructors and students? Communicative Competence: One of the major challenges of any introductory language course is to give students ample exposure to the language and sufficient opportunity for speaking practice to inspire them to communicate with confidence. Avanti! satisfies students' desire to communicate in everyday situations right from the start. In Connect Italian students have access 24/7 to the digitally enhanced eBook, the interactive textbook activities, the online Workbook / Laboratory Manual activities, all of the accompanying audio and video resources, and the voice tools that allow for out-of-class practice of important oral skills. Review and Recycling: Since introducing and practicing each grammatical structure once in a year-long course is simply not enough to promote acquisition, recycling vocabulary and structures for maximum exposure is a key feature of Avanti! Every fourth chapter provides practice of four previously taught grammar points, which are then followed by a related topic. With the addition of LearnSmart, a super-adaptive learning system, students can practice key vocabulary and grammatical structures outside of class. This powerful system helps students identify their weaknesses and provides them with an individualized study program based on their performance. Manageable Scope and Sequence: Avanti! responds to instructors' concerns that most programs attempt to cover too much material in the first year. We have designed an elementary course that reflects reasonable expectations for the amount of material that most beginning learners can acquire in one year of classroom instruction, while providing the necessary practice students need to acquire these structures. The Connect Italian platform includes an assignment builder feature that allows instructors further flexibility to fully customize the course content to meet the needs of their particular students. Instructors may choose to assign all (or a subset) of the textbook and workbook activities as well as some or all of the grammar points presented in Per saperne di più based on their course goals. Cultural Competence: Avanti! 's meaningful and extensive exploration of Italy's rich and unique culture is fully supported in Connect Italian through audio and video resources and interactive activities. Throughout each chapter, brief readings and interactive, culture activities promote an understanding of products, practices and perspectives. All chapters end with reading, listening, and writing activities that explore cultural topics in depth. Each chapter also includes an analysis of film clips where students can see Italian society and culture in action. Student-centered Classroom: A significant goal of Avanti! is to engage the learner inside and outside of the classroom and promote students' personal sense of responsibility to interact with the material and maximize learning. To this end, the inductive presentations of vocabulary and grammar, which encourage language processing and cognitive engagement, can be successfully completed in the classroom or by using the interactive versions in Connect. Administrative Challenges: The Avanti! program provides the online tools to reduce the amount of time and energy that instructors have to invest in administering their course. The Assignment Builder allows instructors to easily sort activities according to a variety of parameters that are important to them, including by learning objective, language skill, topic, amount of time on task, or by activity type (multiple-choice, fill-in-the-blank, and so on). With Reports instructors can pull full administrative reports about students' performance, and coordinators will be able to integrate these reports across all sections to see the performance of the entire program. The at-risk student report also allows instructors to quickly identify at-risk students, based on numerous criteria, who may need additional help to successfully complete the course. *Connect Italian, including but not limited to the workbook/lab manual, LearnSmart, the video program, and chat tools, is sold separately and does not come automatically with the purchase of the textbook. LearnSmart, the only super-adaptive learning tool on the market, is proven to significantly enhance students’ learning and improve course outcomes. Available within Connect Italian and as a mobile app, LearnSmart provides students with targeted feedback specific to their individual performance, and additional practice in areas where students need help the most. A reduced scope and sequence allows students to concentrate on what they can reasonably be expected to learn in an Introductory Italian course. Systematic review and recycling of material that has been previously covered to allow students the opportunity to practice putting what they have learned together and truly acquire the language. Grammar in Avanti! is taught using an active learning approach, nudging students to discover the language rules through a carefully balanced mix of inductive and explicit grammar presentation. Lessico: these sections use a variety of appealing photos, line art, and texts to present new words and expressions in context. The embedded activities in each encourage students to make form-meaning connections in French, rather than English. Avanti! has been carefully constructed around an extensive video program that serves a dual purpose: It intriduces new language structures and high-frequency expressions, and it provides a window into the cultures of the French-speaking world. Cultura: Throughout each chapter, brief readings and interactive culture activities promote an understanding of products, practices and perspectives. All chapters end with reading, listening and writing activities that explore cultural topics in depth. Capitolo 3 Cosa ti piace fare? Capitolo 4 Che bella famiglia! Capitolo 7 Cosa hai fatto questo weekend? Capitolo 8 Che bella festa! Capitolo 13 Andiamo in ferie! Capitolo 14 Chi sono gli italiani? Capitolo 15 Quali lingue parli?